So I've been trying since I was about 15 to find a good picture that looked even remotely like the symbol for the Penndragon vampire family in my books. I've never found one. Ever. And I should explain the fact that I am in fact extraordinary picky about such things. 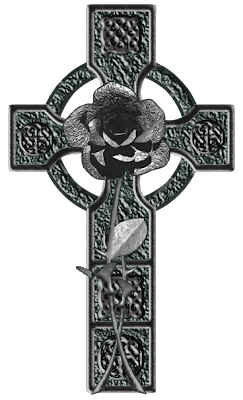 It's a Celtic cross with a rose. Now I didn't want it to look like a symbol of a rose like they used on old coats of arms. I wanted it to look like a real rose. There in lay the problem. Everything I found looked like it had a Tudor rose on it. That was so not what I was looking for. Or I would find one that looked like it was wrapped in barbed wire. *Gasps* For the love of all that is good and holy, NO!!!!! Well my hubby is quite talented graphically. And he's been learning 3D programs too, so I asked him if he thought he could make me what I wanted. So we put our brains together and I researched crosses until I found the perfect shape, and he made it for me! Check it out! Melissa got off her booty and posted something! Nicky grabs my arm and cuddles it, "Mommy, I'm not going to let go of your arm." He studies my arm for a while before asking, "What are your arms for?" "Well, they're for holding boys and giving hugs. What are your arms for?" With a HUGE grin on his face, he tells me, "For shooting! And for holding the Wiimote!" My little guy started swim lessons this week. He's in a class with about 7 other 3 year old's, and there are two instructors. That's them with him. Now don't get me wrong. They are great instructors, and he really, really loves them. That just seems like a pretty large student to teacher ration when you've got 3 year olds in water that's over their heads. Me: *upon seeing a tupperware container in the back of the fridge with pasta in it that has been there for at least 2 weeks because it got stuck behind something* Hmmm I wonder if I can put that on the compost heap or if it's too old. Me2: Hmmm, yeah it's been in there a while. Me: It might not be a good idea. Me2: Wait, you dumbas*! You're putting it out there TO ROT! It'll be fine! ...seen anyone who looked EXACTLY like a character in one of your books? Or if you're not an author have you ever seen someone who looked just like how you pictured one of the characters in a favorite book? It happened to me once. I was sitting on the subway in London, where I was for a summer theater program, and I looked up and right across from me was an absolutely beautiful man with long black hair and blue eyes. He was dressed in a suit and a long coat, and he looked EXACTLY like I'd always pictured my very favorite of all my heroes. My heart started pounding in my ears, and I had this moment that I think a lot of writers get when they're not quite sure where reality starts and their imagination ends. Things to Know Before Killing Your Zombie Loved One - This is as close to horror as I can manage I think. The Princess and the Dragon - Because sometimes the princess doesn't need to be saved. I was just going through my webpage in some preparation for redesigning it and thought I would link these. Hope you enjoy. I was looking for something today and found this outline for a speech I did on jousting when I got my Bachelor's. And since I may someday need to remember the rules of the joust and I'm lazy and don't like hunting through my files, I'm going to share it on here. I. Who here enjoys watching the Razorbacks win on the football field? A. Jousting was the football of its day. 1. In the student section we are all crammed together like sardines. We are like the peasants of the medieval days. 2. Hog Heaven, with its chair backs and indoor food court, is full of alumni and the like. They are like the aristocracy. 3. The indoor/outdoor sky box where our esteemed teacher, Coupe, sits is like the plush box of the royal family. B. Jousting evolved from an exercise to keep troops in shape, to a form of entertainment that was widely adored in Medieval Europe and is still practiced today in some places. Look, Dude! I don't know what your problem is, but if you glare at me again because I don't want to move my 3 year old, 1 year old, and bags to a different cart, then I may have to talk to your manager! Seriously! This is the third time you've done it! I always get my stuff on the stand before the person in front of me is done checking out, so it's not like you have to wait for me to finish unloading before you can start checking me out! Today there wasn't even anyone in line behind me!!! But you looked at me like I was wasting your time, because you had to use a whole half a second to move the cart out of the way that was already there so I could park mine where it was. For the love of all that is good and holy! I'm so sorry I wasted that half second of your day!!! Do you know how difficult it is to load and unload small children from shopping carts!?!?! Yes, Size REALLY does matter! Okay, if you follow me on twitter, then you've heard my lamenting of over air conditioning woes. In fact, I whined about it on here, about 3 weeks ago. It was a long, irritating, expensive process!!! But now we have our air conditioner!!! No, that's not it. That's the lame little unit we had. We added onto our house a couple of years ago. When we bought it, it was a whopping 900 square feet. Now it's almost 1400. So you can imagine that our air conditioner which was bought 14 years ago for the 900 square foot house just wasn't cutting it anymore, even before it broke down. Some of the lovely features of this old unit were the rust covered top and the messed up metal thingies on the side. I know. I know! How could I ever part with it!? It was difficult. Let me tell you! So I found this adorable puppy online and decided I had to try to make a similar one. Well...I've never actually carved a cake before. So as you can imagine it was somewhat terrifying. All the time while of course wearing my lovely apron from Apron Frenzy to keep my clothes from becoming completely covered with cakey goodness. :D I'm becoming somewhat of an Apron addict since discovering The Apron Goddesses. Nicky watering the watermelons and corn. I can't believe people don't grow Eggplant just for these precious little blooms!!! They look like little fairy skirts! There's a brief tour of our garden. :-D Hope you enjoyed. This is a boy after my own heart! Bryon: What do you wanna eat? Finn: *raises the spoon he's playing with in the air* Piiiiiizza!